is get my clothes clean, remove stains and have them smelling good. to last the entire month. Tropical passion wasn’t such a bad fragrance when initially sniffing it in the bottle, but when it was in the washing machine, the fragrance seemed to change. At least to me it did. The fragrance tropical passion is a blend of green kiwi, papaya, guava nectar. Petals of orchid, ylang ylang, sweet plumeria, warm essences of cashmere woods and patchouli blossoms. In my opinion this is a lot of different scents mixed together to make one fragrance. they weren’t as clean as I would like. The thicker pieces seemed to still faintly smell like the gross smells from job and my gym suits still smelled like sweat. I ended up soaking them for fifteen minutes and then washing them for a second cycle with more detergent, about three capfuls this time. After two washes, and a spin in the drier, my clothes finally were clean. to be more concentrated it would have been more effective in cleaning thicker pieces of clothing. I also feel that they should take it down a notch in the fragrance department too. I would recommend this to a person who doesn’t have a lot of soiled clothing to wash. 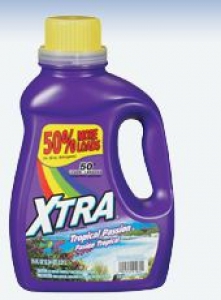 But to a person who has a lot to accomplish in the laundry department, I would tell them not to waste their time and money on this detergent, and to just dish out the extra cash and buy what you know works. Yes. 100% agreed. It also smells fresher.